Please explore our 2014 annual report below. If you’d prefer you can also view a Flip Book version or view a PDF version. Many women who suffer from fistula live in the shadows, hiding their condition out of shame, perhaps not even knowing treatment is available. But Habiba Corodhia Mohamed always finds a way to bring the condition, and these women, into the light. Habiba is the founder of WADADIA, a community-based organization in western Kenya that provides psycho-social support, economic empowerment and reproductive health to women in need. She also serves as outreach manager for Fistula Foundation’s action on Fistula program, educating communities and helping find and refer patients for treatment. Her support for patients doesn’t stop once they get treatment. The “Habibathananga” fistula reintegration model she created is used for every patient, providing post-surgical counseling and structured therapy sessions for the fistula client and her family. Habiba’s innovative and holistic approach is working, and more and more women are stepping out of the shadows to seek treatment as a result. 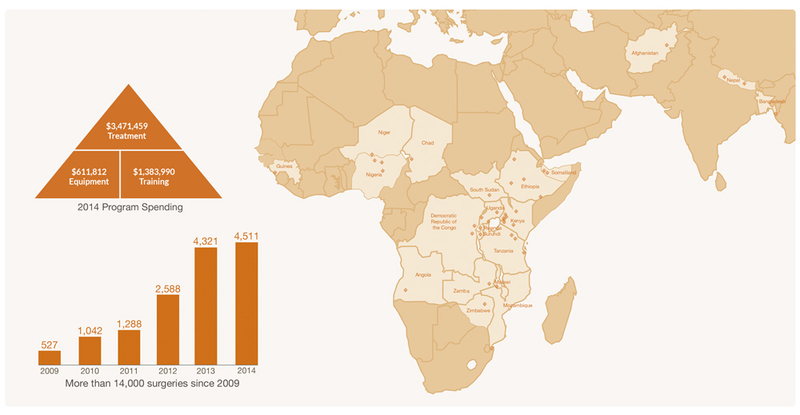 2014 was a game-changing year for Fistula Foundation. By the close of the year, we had supported a record new number of surgeries, helping more women regain their lives. We also launched a new and innovative program in Kenya, with critical support from pharmaceutical leader astellas Pharma EMEA to build the world’s first fistula treatment network. In addition, we strengthened our partnership with FIGO (International Federation of Gynecology and Obstetrics) to train more fistula surgeons than ever before.Obstetric fistula is a childbirth injury affecting a million of the poorest and most vulnerable women in the world. We are in business to help end the needless suffering. We aspire to help create a world where no woman will live in misery simply for trying to bring a child into the world. Fistula Foundation was honored to be selected through a rigorous and competitive process by Astellas leadership to develop an ambitious new program, called Action on Fistula. This nearly $2 million program over three years is deeply innovative, and enables us to tackle fistula from every angle: expanding the pool of trained fistula surgeons, engaging communities, and expanding the network of hospitals in Kenya providing high quality fistula surgery. One year in, we already see the potential to replicate this strategy for comprehensive fistula treatment in other countries and regions. We remain committed to removing one of the key bottlenecks to treatment: scarcity of surgeons trained to treat fistula. 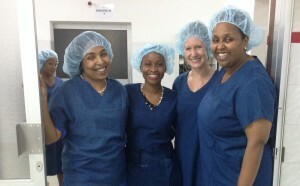 Through our four year partnership with FIGO, we are helping train several new surgeons. Long-term partner Johnson & Johnson continues to be a critical supporter of Foundation work, helping us support new facilities through their innovative small grants program. As you read through this report, we hope you will be inspired by the stories we’ve collected from the field, from dedicated surgeons, creative outreach works and brave women who have come forward for treatment after having endured so much. Because of you, we’re treating more women in more places than ever before. your support enables us to identify and partner with respected organizations on the ground who work in clever ways to increase the number of women who receive surgeries that change their lives forever. Celina, age 30, delivered a stillborn baby after two days of labor and developed fistula. It was years before she met an outreach worker who referred her for successful treatment. Fistula Foundation Board Chair Dr. Sohier Elneil (far right) visits Comprehensive Community Based Rehabilitation in Tanzania to certify the facility as an official FIGO training center. Funding from Johnson & Johnson helped us upgrade equipment at the Laure Fistula Center that had been in use for 20 years. To successfully treat fistula, three elements are needed: a patient, a trained surgeon and a properly equipped facility.Yet, each of these elements are deceptively simple. Patients often hide their condition out of shame or don’t know that their injury is treatable, making them difficult to find. There are not enough surgeons available to treat the growing backlog of patients, and other types of fistula care providers are also in need of more extensive, specialized training. Many facilities lack even the most basic equipment.There is much work to be done, and Fistula Foundation is committed to helping our partners treat fistula from every angle. Too often women with fistula suffer needlessly. Because fistula is most common in women living in remote rural areas, treatment can be challenging for them to access. Sometimes a woman does not know that her injury is treatable. Other times she may not have the means to get from her village to a hospital for treatment, or she may be afraid to travel to a distant city where surgery is possible. A successful fistula treatment program must incorporate a patient outreach component that helps educate and persuade women to receive treatment. Trained fistula surgeons are in short supply, limiting fistula treatment capacity. Fistula Foundation is partnering with FIGO (the International Federation of Gynecology and Obstetrics) to support surgeon training at approved fistula training centers. Johnson & Johnson helps to support the FIGO fistula training program, which provides training and mentorship to qualified surgeons from countries with a high prevalence of fistula. Training is based on FIGO’s Global Competency-Based Surgery Training Manual, a pathbreaking manual authored by Fistula Foundation Board Chair, Dr. Sohier Elneil. Facilities must be accessible and equipped with the right equipment. Many of our partners have become accustomed to working in less than ideal conditions, performing surgery with aging equipment, or making due with tools that may not be the most appropriate for fistula surgery. We listen and respond to the needs of our partners and help provide support that will enable them to provide surgery in the safest environment possible. Action on Fistula is a groundbreaking partnership between Fistula Foundation and Astellas Pharma EMEA in Kenya. It is delivering life-changing surgery to more women in more hospitals, increasing the pool of trained fistula surgeons and developing a fistula treatment network to enable facilities to collaborate and share resources and engage outreach workers in clever new ways. 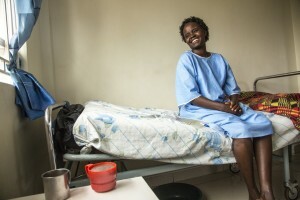 Action on Fistula helps more women to get treated more quickly with a higher quality of care. Representatives of Fistula Foundation, Astellas Pharma EMEA and Jamaa Mission Hospital in Nairobi celebrate the launch of Action on Fistula. 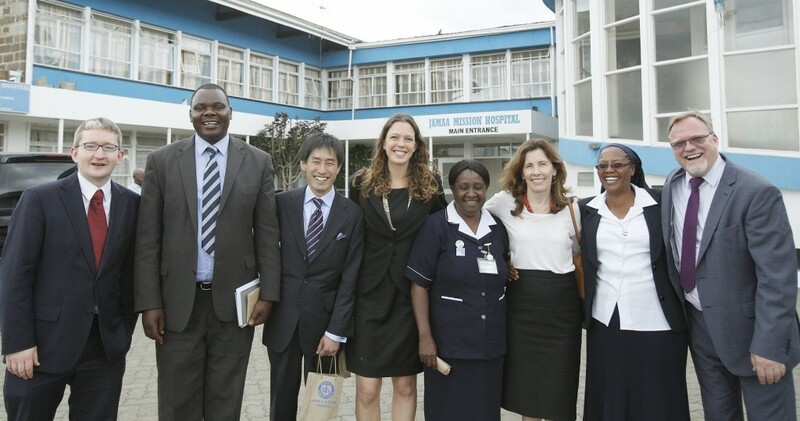 Before Action on Fistula (AOF), there were only two hospitals in Kenya providing routine fistula surgery. There are now four, and two new centers will open in 2015. Further, the AOF network provides surgeons at AOF sites with open lines of communication, helping improve patient care and facilitating patient referrals to both overcome waiting lists and ensure patients that need specialized care receive it. This strategy helps more women get treated more quickly with a higher, consistent quality of care. 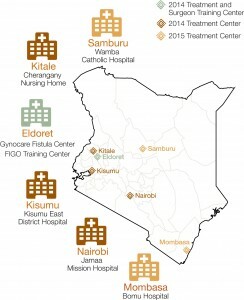 Astellas support enabled Fistula Foundation to partner with the International Federation of Gynecology and Obstetrics (FIGO) to certify the first Fistula Surgeon Training Center in Eldoret, Kenya, that is now helping train the next generation of fistula surgeons. 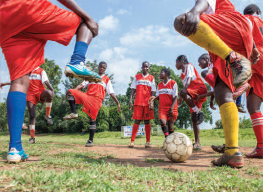 WADADIA’s Let’s Kick Fistula Out of Africa football club provides fistula education and screening at each of their crowded matches. 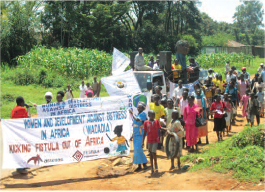 A traveling road show took entertainers to several villages, attracting large crowds that learned about fistula and how women can get help. Trained in Belgium as a general surgeon, Dr. Sinan Khaddaj worked for many years as a surgeon in africa and asia before joining Médecins Sans Frontières (Doctors Without Borders). 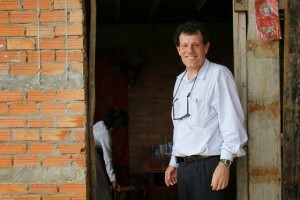 There, he designed and implemented innovative surgery programs in conflict zones around the world. Through this work, he realized there were no organizations focused solely on women’s health in low resource areas globally. He set out to change that, responding to a call from Her Highness Sheikha Shamsa bint Hamdan al nahyan of the United arab emirates who tapped Dr. Khaddaj to help her create Women and Health alliance International (WAHA), an organization focused on addressing maternal and neonatal health in disadvantaged communities throughout the world. Dr. Khaddaj’s commitment to working within existing local public health infrastructures to build capacity amongst healthcare workers has helped deliver fistula treatment in conflict zones and other difficult contexts, where treatment never existed before. WAHA is one of Fistula Foundation’s longest-term and most revered partners, having worked together on over 30 projects in 18 countries. The challenge of delivering high-quality fistula treatment is too great for any organization to meet on their own. We remain truly grateful for our nonprofit and corporate partners, and for individuals at these institutions and beyond, who help us give new lives to so many women. 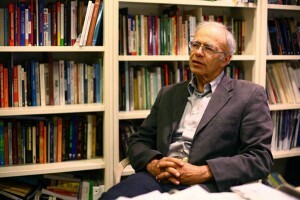 Founded by Peter Singer and based on the effective giving principles outlined in his book of the same name, The Life You Can Save organization encourages people to publicly pledge a percentage of their income towards improving the lives of the world’s extreme poor. They recommend 16 charities that provide the most cost-effective programs to alleviate suffering among the world’s poorest people. Fistula Foundation is proud to be among these recommended charities, and we are grateful for the financial support and expertise that the organization continues to provide. One extraordinary donor, who wishes to remain anonymous, enabled us to fully fund fistula treatment at our partner sites in Chad, Democratic Republic of the Congo, Nigeria and Sudan. Because of this selflessly generous person, more than 1,000 women received life transforming surgery in 2014. The words “thank you” seem inadequate to express our profound appreciation for this anonymous angel. Generous support from Astellas Pharma EMEA enabled us to develop Action on Fistula, the largest scale and most well-funded program we have ever undertaken with any partner in any country. In just the first year of our partnership together, this program has already become a blueprint for our comprehensive fistula treatment efforts in other places. 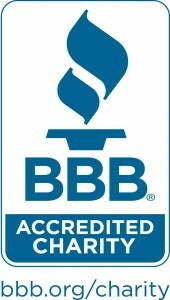 We remain grateful for the support of Johnson & Johnson, a company that has been a dedicated partner for over a decade. Johnson & Johnson has provided funding for projects in Ethiopia, Bangladesh and Zimbabwe, and for an experimental small grants program that distributes targeted funding to partners who demonstrate the capacity to utilize a small funding boost to increase the quality and quantity of surgeries they are able to provide. One of our longest-term partners, we are proud to provide continued support to Direct Relief to update and disseminate the Global Fistula Map, the single most comprehensive source on the worldwide availability of fistula treatment. 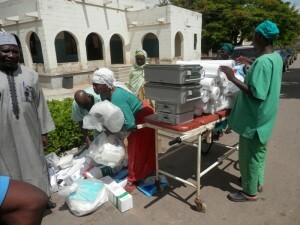 We also provided funding for 25 shipments of fistula-related medical supplies to 22 partner sites across 15 countries. We are proud to be a partner of UNFPA Campaign to end Fistula, a global movement to improve maternal health and reduce the number of obstetric fistula patients in low-resource countries. Fistula Foundation is grateful to be a member of Aid for Africa, a charity alliance of U.S.-based nonprofits and their African partners working to help children, families and communities throughout sub-Saharan Africa. Every day, people like you are working to transform the lives of women who suffer from obstetric fistula. Mary Ann has always been interested in improving the lives of disadvantaged women. When she learned about obstetric fistula more than a decade ago, she was determined to find a way to help. She realized her talent for quilting might be a clever way to help educate others about this heartbreaking condition. Her first quilt portrayed the back of women’s heads alongside text that read “Waiting,” to show they were waiting for surgical repair. When that quilt was sold, she sent the funds as her first donation to Fistula Foundation. When she met Sherri Culver, another quilter who was also interested in raising awareness about fistula, she knew a partnership had been made. Together they developed a quilt titled “Only a Girl,” to which they will add panels that will help tell the full story of fistula, from a woman’s obstructed labor to her eventual surgical repair. 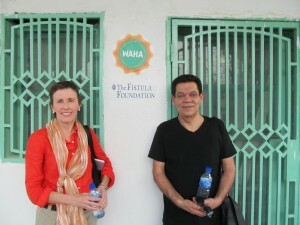 Mary Ann’s quilts hang on the walls of Fistula Foundation for all to see, and will be used to raise awareness about fistula at various educational events. Each year, clubs compete to sponsor a school-wide penny drive. After a competition, her club won and they were able to use the opportunity to raise funds while highlighting the problem of obstetric fistula. At the end of the fundraising drive, her club had raised almost enough to fund two surgeries. 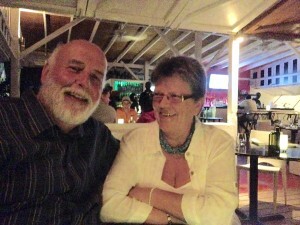 Andy Dutcher with his wife, Margaret Scott. In 2003, Andy Dutcher read a column by Nicholas Kristof in the New York Times about a woman who had been raped, became pregnant, lost the baby, developed fistula and was subsequently abandoned and left to fight her way toward eventual treatment. He couldn’t stop thinking about her story. He took the article to his church giving circle, which met weekly to discuss charities to which they would make pooled charitable donations. He had already decided to act, having signed up for Fistula Foundation’s Love a Sister program, through which he generously covered the cost of one woman’s fistula surgery each year. He invited the giving circle to join him, and they did. 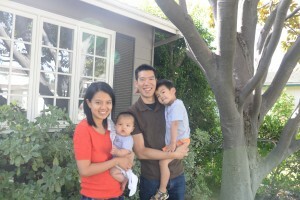 Ling and Darren Lew, with their children, who are wearing their Fistula Foundation onesie and toddler tee! Helping women in underprivileged areas of the world has always been important to Ling and Darren Lew. They began to donate monthly, and decided to supplement their regular giving with a generous gift of stock. Now that Darren and Ling have two children of their own, the couple has found an even greater connection to the issue and feel it is important to continue to help women who don’t have adequate medical care. “We realized that by helping a woman with fistula, we would not only be helping to change the life of just that one woman; our support for her could also be transformative for her family and for her community,” said Darren. 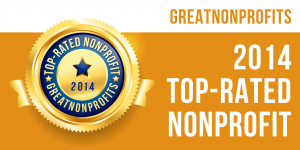 We are proud to be Top-Rated by GreatNonprofits, where nearly 300 supporters have recognized our work with the highest rating possible. 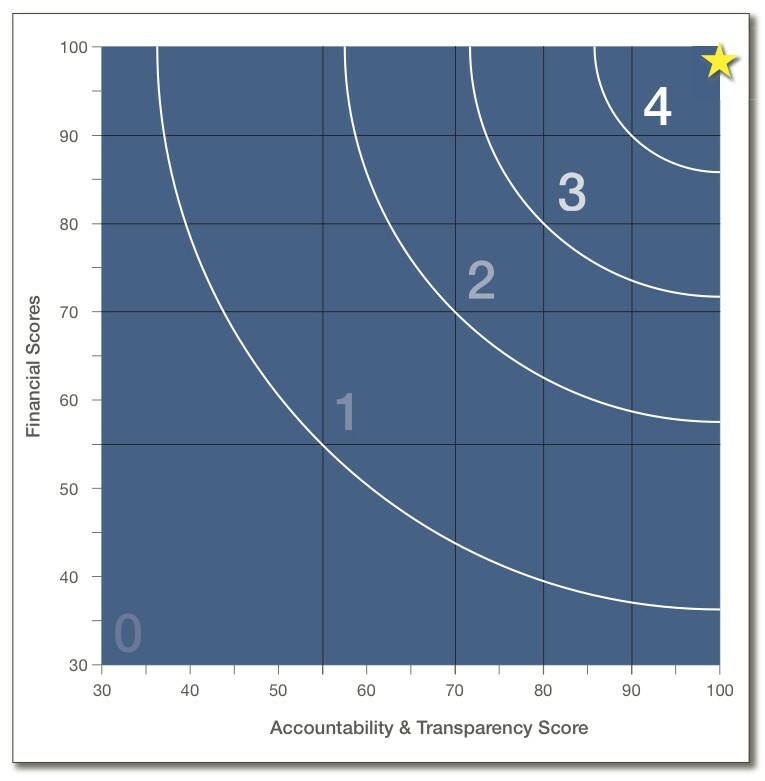 CharityWatch ratings are considered the most stringent in the sector. 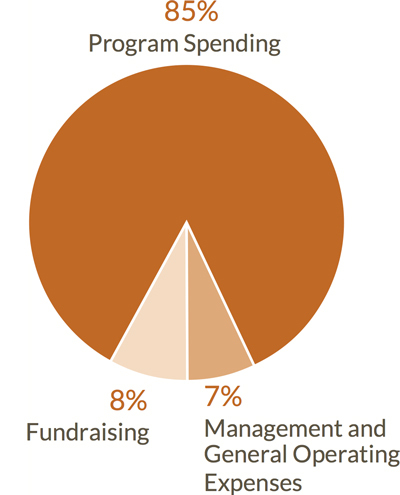 We continue to earn an “A” grade for our commitment to program spending and low fundraising costs. 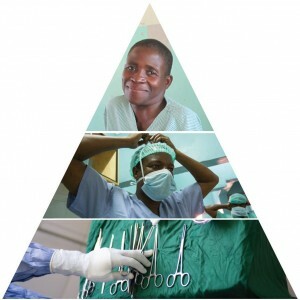 View a complete list of Fistula Foundation staff and board and bios here. (L-R) CEO Kate Grant poses with outgoing Board members Robert Tessler, Linda Tripp and Dr. Larry William. 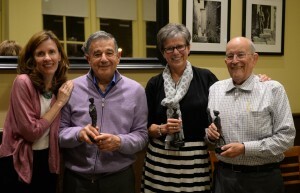 In recognition of their long-standing service and contributions to our Board, Fistula Foundation was proud to present the 2014 Dr. Allan Rosenfield Award to Linda Tripp, Dr. Larry William, and Robert Tessler. The award is named for the late Dr. Allan Rosenfield, who served on Fistula Foundation’s Board of Directors for five years. As Dean of the Mailman School of Public Health at Columbia University, he was known globally for his pioneering leadership and myriad contributions to the field of public health. 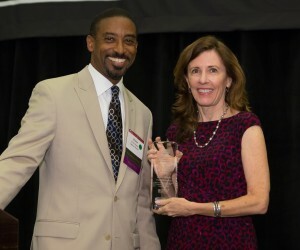 (L-R) Peter Barber, incoming chair of the AMA Nonprofit Marketing Conference, poses with CEO Kate Grant. Photo courtesy of Peter Barber. This year, CEO Kate Grant was named “2014 Nonprofit Marketer of the Year” by the American Marketing Association for her visionary leadership of Fistula Foundation. The award recognizes leaders who are committed to strategy, results and impact, and Kate was commended for her work in transforming the size and scope of the Foundation since becoming its first chief executive in 2005. She is the eighth nonprofit leader to receive this award. 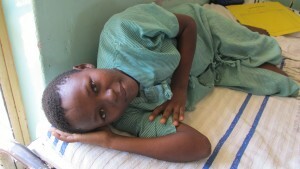 Faith developed fistula when she was only 12 years old. In the nine years it took her to access surgery, her mother made the decision to leave the household. But her father, Isaac, stayed. He is Faith’s strongest supporter and advocate, and remained at her side for every single doctor appointment along the way. Faith received free surgery this year through the Action on Fistula program at Gynocare Fistula Center from the dedicated Dr. Hillary Mabeya and his team. Her fistula was extremely complicated to repair. It took several surgeries to heal completely, but today, nine years later, Faith is finally fistula free. With support from Habiba Corodhia Mohamed and WADADIA, she received extensive reintegration assistance. She was able to enroll in a reintegration and literacy program offered to fistula patients at Gynocare that helped prepare her to return to school. Her new teacher told us that in a matter of one month, Faith went from being barely able to hold a pencil on her first day to becoming one of the brightest students in her class. 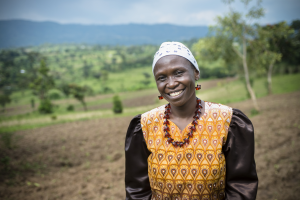 access to free fistula repair surgery transformed Faith’s life, restoring her health, her happiness, and giving her a bright and promising future.